I love those silver spots – they are like lovely stars! 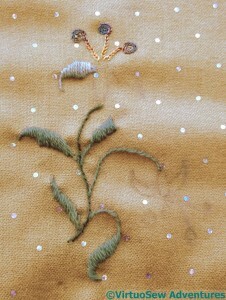 Your test stitches are all gorgeous, and I think the sparkle on the Pashmina will look a really pretty background for the flowers! I too love the silver spots — today they might be tiny snow flakes — tonight the stars. Your stitches are beautiful as always. So pretty, Rachel! The flowers in silk will be perfect. This will be lovely, but I’m not too sure about the silvery spots. I know I’m in the minority here :). Hmm, the spots don’t quite seem to go. But maybe you could link them in by using sequins or shiny beads for the stamens? Or maybe not. Scale does matter – people often try to work designs too small for the fabric and threads. 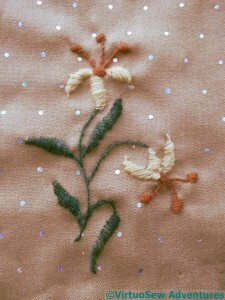 Just to encourage you, Jane Austen’s satin stitch spots might not have looked that good when they were finished. She’s more famous for her clever words than for perfect stitchery and there may be a reason for that! 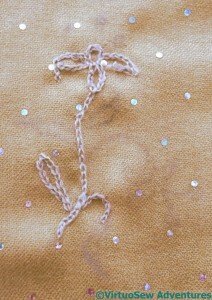 As you know, I’ve tried out the same sprig in shadow work on two fabrics so far. I am about to try it on a thin cotton from a handkerchief, to see how that goes, and whether the shadows show through enough. Experimenting is half – if not three-quarters – of the fun. 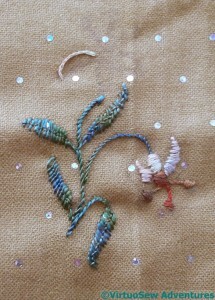 As always your stitching is beautiful, and as always I am looking forward to seeing the progress of this project! I think you are right about the silk thread it does sit the best. And I’m with you concerning those ladies in the 1700’s. As ever, I’m amazed at your attention to detail. I’d have just grabbed the first set of threads I liked the colour of and got stuck in!! Now you’ve done the thread trials will there be more experiments for different colour ways? This one is going to turn out so well..you’ve planned and tried out so many options already ..kudos to your patience Rachel. I think silk threads will mute down the silver a little..
Pingback: The Great Lady’s Magazine Stitch Off goes to Chawton House Library | Uncategorized | Aggregated blogs on Romantic Studies - please click through to read full posts. It is so interesting to see how the different yarns/threads lays on the fabric and the care you’ve taken to try out each. Our oldest daughter gave me a collection of lovely silk embroidery threads that she picked up at a market in Shanghai. They are so fine that I’ve been scared to even try stitching with them yet. I’m not even sure how I should store them. I’m a bit late visiting… but thanks so much for linking up to last week’s Stitchery Link Party. Aloha hugs! I like the background, even with spots. Did you stabilize it with something? You went to a lot of trouble to get just what you wanted in threads, and I know it will be lovely. I’ve thought about the English embroiderers, as so many books talk about them going into the village to pick up silk threads! I’ve always thought they did a lot of work and had plenty of time with households of servants, but how convenient to simply walk a mile into the village when you needed some threads! Sounds like a project that’s right up your street. I hope you’re happy with any progress you’ve made on this.